So, let's talk about Biodynamic, shall we? 1. Are "Humans coming to their sense"? Biodynamic is nearly unavoidable, (and it is a good thing), as humans are finally coming to their senses, realizing that Earth needs to be saved and that they need to be more disciplined, stop overproduction and overconsumption, and, more particularly, that they must stop destroying the planet by polluting the ground, the water and the air with chemicals and plastics and other fossil energies derivated products, to go back to more natural and environmentally friendly methods and cultures. As per the statistics, only 10-15% of all the plastics produced in the world are recycled, and this recycling is incredibly onerous, expensive and consumes a lot of energy.... and, as per certain websites, like https://plasticoceans.org/the-facts/: "We are now producing nearly 300 million tons of plastic every year, half of which is for single use. More than 8 million tons of plastic is dumped into our oceans every year." Therefore, the rest is either incinerated (which pollute the air) or buried in landfills (which pollute the soil). 2. So why writing, yet, again, another article on Biodynamic? In his article, he explains the reasons why he prefers Biodynamic wines over any other wines, and I must say that, for the most part, I cannot necessarily disagree with him. Yet, (and like with many of the other articles that have been written on the subject over the past 2 decades) certain things in his article made me wonder and made me ask myself a few questions. The reason why such articles about biodynamic viticulture (biodynamic farming in general) and biodynamic wines always make me wonder, is because, every time I just finished reading an article on the subject, it annoyingly makes me feel that the person who wrote it would rather have all vineyards converted and all wines produced under biodynamic methods, disregarding, or even worst, discarding all the other methods. And, every time, I feel that way, it really irritates me somewhat... (...you know that feeling that if the guy (or gal) was right in front of you, you would probably tell him/her a few words...)... and always makes me wonder why they don't (or can't) understand that biodynamic methods and processes cannot necessarily be applied everywhere (meaning not in certain regions and/or under certain climate/micro-climate), and thus not every vineyards can be converted to and not every wines can be Biodynamic. Of course, it will be great and so much better (to a certain extent), if all the vineyards and wines of the world could be respectively converted to and produced via the biodynamic methods: better for the environment, better for the soil and subsoil, for the plant, for the life surrounding the vines and the vineyards (fauna and flora), etc..etc..
1. 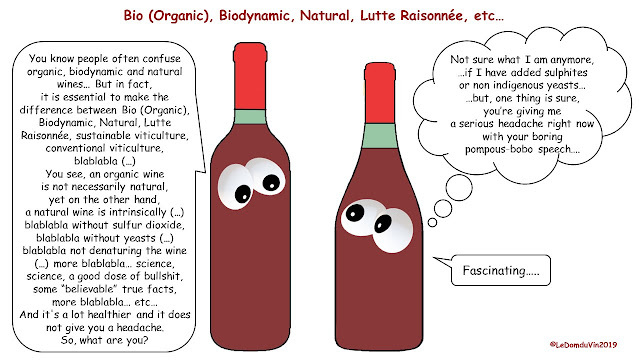 First, let's go back to basic... what is biodynamic? So, there you are! 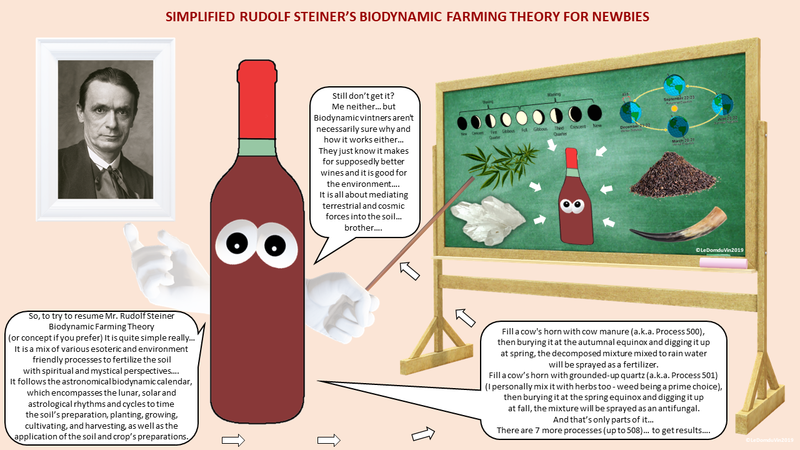 You now know what Biodynamic Agriculture (and thus Viticulture) is... or do you, really? 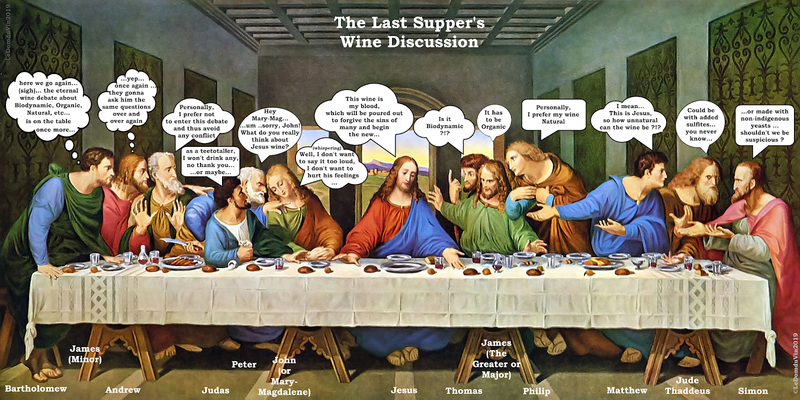 Yet, and even if some of you may already consider themselves as experts on the subject and surely do not need any lecture or guidance from a Sommelier like me (which I could definitely understand), please allow me to try to resume the big lines quickly for you. 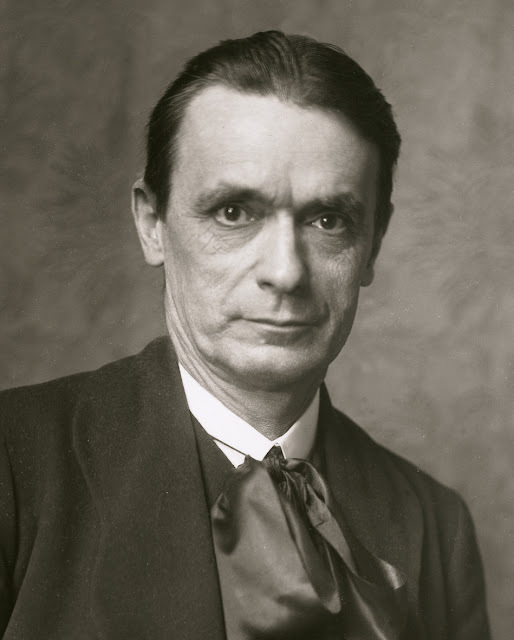 The Biodynamic Farming Theory (or concept if you prefer) was elaborated/created (or founded if you prefer) by Rudolf Steiner back in 1924, based on the lectures of ideas, concepts, researches and studies on agriculture he started at an earlier stage, back in 1910, in response to questions asked by farmers and growers facing the depletion of soils and a general deterioration of crops and livestock (in Austria and Germany). Moreover, back then between 1910 - 1918, the end of the Austro-Hungarian Empire (1867-1918), also the end of and after WWI, between 1918-1924, the market value of Austrian agricultural products and services decreased by nearly 48% (**), which did not help to reassure the worried farmers and growers. The depletion of the soils and deterioration of the crops and livestock were, (directly and/or indirectly), the consequences of the "Second Industrial Revolution" (1870-1914), World War I (1914-1918), as well as the end of the Austria-Hungary Dual Monarchy (1867-1918), leaving Austria and Germany in bad shape... A solution needed to be found. A man of many hats and controversial public figure, Rudolf (Joseph Lorenz) Steiner (1861-1925) was an Austrian philosopher, skilled scientist, social reformer, architect, scholar, lecturer and an esotericist, who initially gained some recognition at the end of the 19th century as a literary critic and published philosophical works; then founded, at the beginning of the 20th century, the esoteric spiritual movement called "Anthroposophy" (a blend of philosophy and theosophy), and published books on philosophy, theosophy, life, education as well as on esoteric and occult sciences, while attempting to synthesise science and spirituality. Around 1910, Steiner, who was everything but a farmer (actively involved into art and architecture at the time), embarked on a personal study and research on farming and agriculture, and thus the science of the soils and the plants and their environments. In fact, he mostly gathered and applied the old know-how and practices of the old days farming and agriculture, to which he applied esoteric concepts and processes with a cosmological-spiritual-ethical-ecological approach. Based on his suggestions and spiritual science, generations of farmers, gardeners, viticulturist, and researchers developed biodynamics as a healing, nurturing, holistic, ecological, organic, and spiritual approach to a sustainable care of the Earth. Biodynamic methods consider the farm or garden to be a self-contained organism, embedded in the living landscape of the Earth, which is in turn part of a living, dynamic cosmos of vital, spiritual energies. The aim is to increase the health and vitality of the whole, including the farmer or gardener. The biodynamic practitioner follows an alchemical, transformative path of working with the Earth through the nine “homeopathic” preparations created by Steiner. Anciently simply known as "Farming", "Organic" and "Biodynamic" culture and agriculture have in fact both always existed under the sole and unique name of "Farming"until let's say the apparition and use of the chemicals. Farming was the way of the past, and when I say "past", I mean the good old days of our great-great-great-grandparents. More precisely, the old days prior chemicals first appearance during the "Industrial Revolution" within the second half of the 18th century. Rooted in the alchemy of the medieval times, chemistry led to the creation of chemicals roughly around 1750s, then first classified around the late 1780s by Lavaoisier in his "Methods of Chemical Nomenclature" (1787), where he invented a system of naming and classification still largely in use today, including names such as sulfuric acid, sulfates, and sulfites (***). , Chemicals were further developed around the end of the 19th century, and their use gradually intensified up to the point when they were heavily manufactured and commercialized in the early 20th century, first around "World War I" and then more especially after and since "World War II". In fact, Farming was the way our great-great-great grandfather use to do it. At the time, treatment of the vines was more natural and respectful of the soils, subsoil and overall environment (obviously as chemicals did not exist and therefore were not around to be used, duh....). Therefore, the knowledge, skills, experiences, and wisdom of the old and wise were passed on from father to son, mother to daughter (and/or vice versa), and work in the field and vineyards was done according to the seasons and the lunar calendar. The old and wise were men and women of earth. Peasants, or farmers if you prefer, who knew what to do by experiences, experiments, as well as from what they learned from their elders and by observing and following the life circles of nature. All these allowed them to know that certain things needed to be done at a certain time of the year or at a certain period of the vegetative life cycle stages. They knew how to recognize the signs of Mother Nature by living in perfect symbiosis and respect with their environment and the land they were working on and feeding on a daily basis.